From a crossroads to a comeback was the message from Pennsylvania’s 47th Governor as he was sworn-in for a second term in office. After sailing to a comfortable re-election bid in November over former state Sen. Scott Wagner (R-York), Gov. Tom Wolf officially began his second term in office today by reflecting on the progress of the previous four years. “My fellow Pennsylvanians: We’ve gone from a Commonwealth at a crossroads to a Commonwealth on a comeback,” Wolf said. He boasted about an improved economy, infrastructure, healthcare insurance, education funding, criminal justice reform and more as points of proof for a successful first term. Wolf touted progressive talking points, but made it a clear in his address that he credits bipartisanship as the reason for improving the state. Wolf likened the “comeback” of Pennsylvania to the return of his daughter, Sarah, and son-in-law, Joe, to the state after choosing to live elsewhere for years, seeing promise in the Commonwealth’s future. The governor appeared to single out the differences in Harrisburg to the current government shutdown in D.C. while parading his first four years. Wolf didn’t harp on one specific policy goal for the next four years, but promised an “ambitious” Pennsylvania, which he believes will lead to the beginning of brand-new possibilities. “…Where we don’t wait around for Amazon to move here, because we’re building the next Amazon,” he said referencing Amazon choosing to take their second headquarters in New York and Virginia. The governor also recalled what he said was “unquestionably the toughest day” of his first term: the shooting at the Tree of Life Synagogue in Pittsburgh that resulted in 11 deaths. 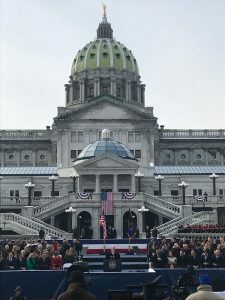 Wolf will be joined in his second term by newly sworn-in Lieutenant Gov John Fetterman, who thanked those in attendance for “braving the cold” and echoed the sentiments of the head honcho in Harrisburg. What a sad day for PA, The man who is next in line biggest accomplishment is bringing a SUBWAY to town he was mayor of and never had a w2 form over $150 I never heard any thing about seeing his tax return. Get ready folks socialism is here and their is plenty of money in PA it is just in the wrong peoples hands!!!! I love how warped the ideologues are on this site. First, Wolf beat Wagner because Wagner is a Trump wannabe but Harrisburg, as Corman said, is not as bad off as Washington, and Wolf is civil. Second, Fetterman is smarter than the people who criticize him on here. He wears his work clothes, yes; but he adapts and comes together and compromises, unlike the tiny-brain ideologues who can’t find anything good to say about anyone whose hair and skin are not colored orange. Fetterman is being cast in the next MIB movie as Agent F.
If you put a pair of MIB shades on him, he totally looks like he should be in the movie. But, I guess you must really love John from a policy standpoint, since your primary criticism is his clothing. Scott Wagner’s defeat is still confounding Republican chieftains. Val D’s “Contract Against Pennsylvania” that served up warmed over 90’s “Greatest Hits of Newt Gingrich” shows how worn out exhausted themes have an seemingly endless shelf life despite their utility being long gone. In other words, like cold pizza, sometimes tired ideas hang around a little too long in the atmosphere. So there Republican search for originality goes on.